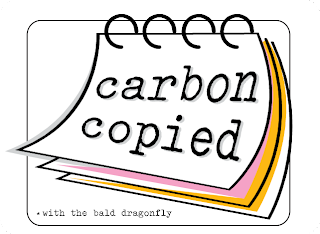 The Bald Dragonfly: Carbon Copied is Here! The talented Lynn, from The Mango Boys and Me, and I are playing along with Jay Gee's Nook Challenge #10! Isn't the inspiration collage beautiful? Today marks the first day of a new feature over here on The Bald Dragonfly! A way for me to get to know you better. A way for bloggers to get to know each other better and a way for challenges to be recognized! An outlet to see the creative possibilities of one stamp set! Simple, honest to goodness fun! Here's basically how it works: Same stamp set. Same challenge. Same post date. Same post time. Lynn and I chose a new stamp set, Iconic Images from Papertrey Ink to feature and one of our favorite challenges, Jay Gee's Nook. If you haven't had the chance to view Lynn's work yet, you are in for a major treat. Her style is classy, her execution top notch, plus, she has four handsome boys! Hop on over to Lynn's blog to see her amazing piece of artwork! Likewise, Judith from Jay Gee's Nook is an exceptional crafter as well and offers up really beautiful inspiration collage challenges, please hop on over and participate! My version of Carbon Copied features one of the images from the set stamped in some watered down distress ink onto a card panel and then the panel was soaked in the remaining ink. Both the image panel and card base were impressed with a texture for added interest. A simple button and floss completed the look, which was inspired by Maile Belles. 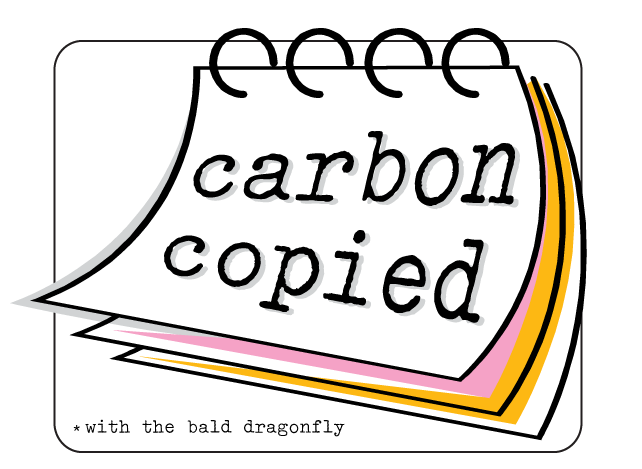 Are you interested in playing along in Carbon Copied with The Bald Dragonfly? 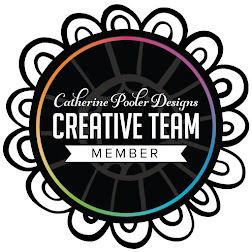 I sure would like for you to add your name and blog address in the link tool below so I can coordinate a future Carbon Copy post with you! Gorgeous card Karen. This is so soft and subtle! I am thrilled to be playing along with you! What an awesome challenge idea and you and Lynn kicked it off beautifully! :) I love that gorgeous panel you created - so much depth and texture with just one colour! WOW Karen, another gorgeous card. What a great idea. I would love to play along but I don't have many stamp sets. Cool idea, Karen, and your card is just lovely! Fab Idea, Karen!! Your card is simply gorgeous!! what a fun challenge! I always love seeing all the different ways people use the same stamp! This is such an awesome idea Karen! I LOOOOVE the card - it's so very pretty with the purple and black! You inspire me, literally, everyday! My first thought was some sort of challenge, too, but I knew that you were already knee-deep in at CAS-ual Fridays. Hmm....you could host a monthly distressing-type challenge. We all need tutorials on just how you accomplish your distressing!! After my one shot at misting I know I have a LONG way to go before I'll exhibit the control and finesse that you have mastered. 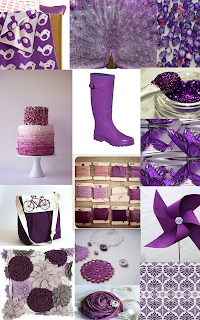 As a purple nut I am absolutely enthralled by your card! Love, love it! Love your awesome idea Karen! And your card is beautiful (as always). That IS an amazing collage of images from Jay Gee's Nook. I haven't done a challenge from there yet but I think I need to give it a go. Awesome idea! I love your use of this medallion stamp. It gives it such a unique look. Fabulous design, my friend! Gorgeous card and fun challenge concept! Love JayGee's challenge as well... Those purples are so gorgeous! Love the idea. And love the card too. Love this card and I LOVE the Carbon Copied idea....very very cool!!! What a fun idea!! 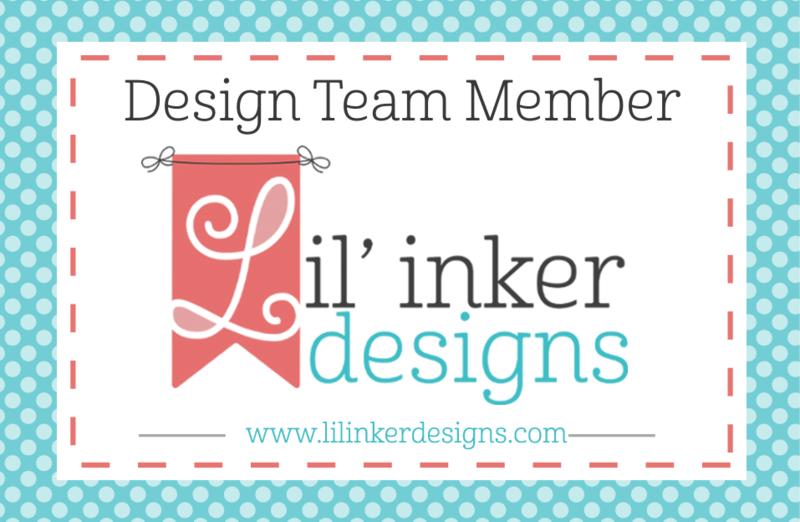 How fun to meet up with so many different cardmakers! Love your card! Indeed very different from Lynns', but both great!! What a great idea for a new challenge! I may not always have the right set, but I'd love to play along when I do. I am in love with the colors you used on your card. Gorgeous!! A beautiful card Karen and such a great idea for a feature. I'd love to play along but would it matter that I'm across the pond?? As I have said many times before, you are the absolute master of these stamped and distressed/misted backgrounds - such a stunning card Karen. Would really love a tutorial on this one - hint, hint! I am very honoured that you chose my challenge to introduce 'Carbon Copied', which is a brilliant idea. Can't wait to play along. Big hugs, Judith. First of all, your card. LOVE the purple... Love the shimmery background... This is just gorgeous!! Second of all, AAAH!! What a fun, FABULOUS idea! Carbon Copied! SOOOOO FUN! Love it! GENIUS KAREN! Fantastic idea & that card is fabulous! I will have to give your idea a try. I doubt I will get the same stunning result but it will be fun to try! Girl, this card is STUNNING! I fell in love with the purple background - BRILLIANTLY done!!! Love it!!! Love the new blog look too! What a great idea! I'd love to join you some week. Very pretty card, love the added texture. Your challenge idea if fab Karen. now how super fun is this?!!!! Brilliant! What a striking card...love the impact of the black! Ok, a) absolutely gorgeous card, i LOVE the look you created here, b)what a wonderful idea you have come up with, carbon copied....fabulous, and c) I really want those purple wellies!! What a great idea! Sounds like so much FUN! Visiting from Lynn's blog and must say your card is so PRETTY! LOVE that you both used the same stamp set for two completely different looks! Just say when! such a great idea, karen! love your oh so pretty card! Stunning card Karen. Love the soft look of it. The challenge sounds fun. What a great idea, it really sounds fun. Love your card - Reminds me of Batik patterns for some reason. Off to check out Lynn's card (Love her blog). Yours too! Carbon Copy is such an AWESOME concept!!! LOVE IT!!! Can't wait to join in on the fun!!! And your card is really pretty!!! Such a great idea! And I love your vibrant purple card! love the card and you know CAS is just the perfect style. What a great idea Karen!! I had no idea when we visited that THIS is what you had up your sleeve! This sounds like soo much fun! I like how you have used the inks in yet another way. Beautiful job! What fun!!! I'd love to play! A perfect CAS card and I love your new challenge. Off to check out the other cards! What a fun idea, girlie!! Love this idea, and definitely look forward to seeing what you and your challenge participants come up with. Love what you and Lynn did with this set - very inspiring. Super fun idea, Karen!! LOVE what you and Lynn did together! I'd love to be part of this some day! So...I'm IN!! I just figured out how this Carbon Copy challenge works. I am calling it a challenge because it sounds like one, a fun one...so, I added my name to the list.